Theorizing Digital Rhetoric takes up the intersection of rhetorical theory and digital technology to explore the ways in which rhetoric is challenged by new technologies and how rhetorical theory can illuminate discursive expression in digital contexts. The volume combines complex rhetorical theory with personal anecdotes about the use of technologies to create a larger philosophical and rhetorical account of how theorists approach the examinations of new and future digital technologies. 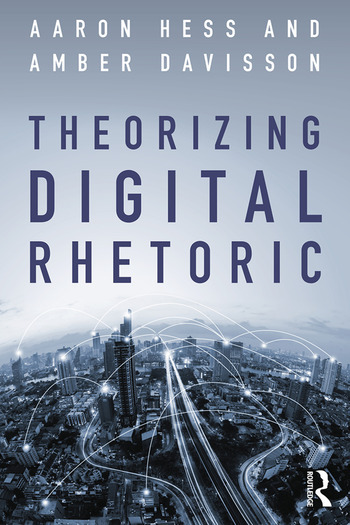 This collection of essays emphasizes the ways that digital technology intrudes upon rhetorical theory and how readers can be everyday rhetorical critics within an era of ever-increasing use of digital technology. Each chapter effectively blends theorizing between rhetoric and digital technology, informing readers of the potentiality between the two ideas. The theoretical perspectives informed by digital media studies, rhetorical theory, and personal/professional use provide a robust accounting of digital rhetoric that is timely, personable, and useful. Aaron Hess is an Assistant Professor of Rhetoric and Communication at Arizona State University. He is the co-author of Participatory Critical Rhetoric: Theoretical and Methodological Foundations for Studying Rhetoric In Situ (Lexington, 2015). His research follows two primary avenues: the participatory elements of rhetorical advocacy and digital rhetorical expression. His work can be found in a variety of scholarly journals, including the International Journal of Communication, Critical Studies in Media Communication, New Media and Society, and Media, Culture and Society. Amber Davisson is an Assistant Professor of Communication at Keene State College. She is the author of Lady Gaga and the Remaking of Celebrity Culture (McFarland, 2013) and the co-editor of Controversies in Digital Ethics (Bloomsbury, 2016). Her interdisciplinary scholarship on identity, politics, and digital technology has appeared in journals such as Rhetoric and Public Affairs, Transformative Works and Culture, Journal of Media and Digital Literacy, Journal of Visual Literacy, and American Communication Journal.